Back in April, we had some pretty heavy frost damage to a lot of the plants in our landscape. 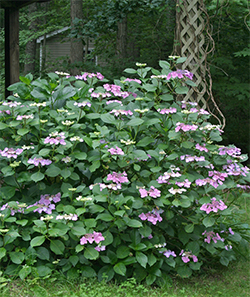 I was especially distressed to see the severe damage to our lacecap hydrangeas. I blogged about it at the time because they looked so bad and I was really worried that the flower buds had frozen. I was pretty convinced that there would be no flowers on our beautiful shrubs this year. My lacecaps are full of blooms despite the seemingly major frost damage this spring. Happily, this wasn’t the case. Not only was I wrong, but I think the bloom this year was the biggest and best ever. The shrubs are full of gorgeous flowers! Thanks Leslie! It just goes to show that patience is a virtue and the “wait and see” approach was a wise decision in this case. I’m glad I didn’t cut them back. I almost did which definitely would have resulted in a bloom-less summer! 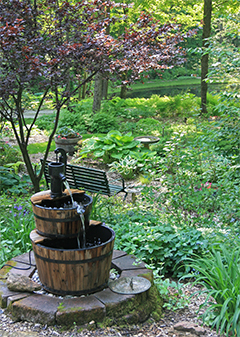 The shrubs and other plants that sustained damage during those frosty April mornings have long since recovered and flushed out fresh foliage to replace the injured leaves. 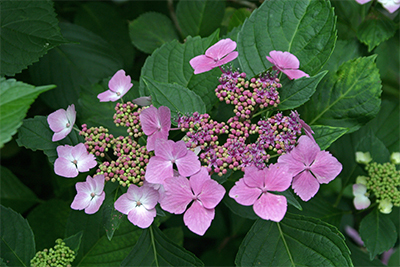 Many are blooming away just like my hydrangeas. The Buddleia in the Viette gardens are beautiful now with lush foliage and are just beginning to bloom. These butterfly shrubs bloom on new wood so Andre simply trimmed them back after the frost, removing all the damaged foliage. The Japanese painted ferns that became so “crispy” after the frost have pushed up new fronds and are now just as pretty as ever! 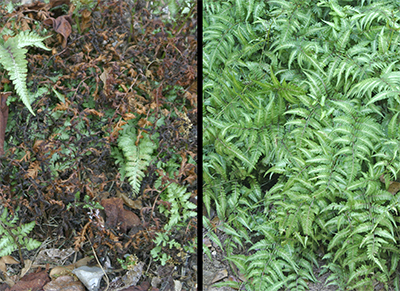 A “before (4/11) and after (6/26)” shot of some beautiful Japanese painted ferns in the Viette gardens. It is truly amazing to me how these plants have been able to recover from this cold injury – or perhaps I just perceived the damage as being a lot worse than it really was. In any case, I’m just glad my hydrangeas are blooming so spectacularly despite almost being “nipped in the bud”! Yesterday afternoon it rained – HARD! Sitting at my desk in the nursery office I noticed that the sky was getting blacker and blacker. I checked the severe weather statement that appeared on my computer and saw that the cell that had prompted the warning was situated right over Hermitage – the little hamlet where we live in Augusta County. It was a very tight little cell on the radar but it was red and deep purple on the map and it was right over our house! At the nursery, gusty winds accompanied the very heavy rain – and we were on the edge of the storm there. 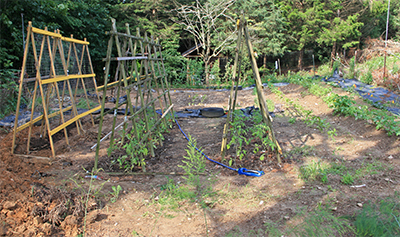 I was really worried about what was going on at my house – especially to my newly tilled and planted vegetable garden. From this angle, the garden still looks pretty good – you don’t really notice the devastation. Since we had been in Vermont for the last 2 weeks of May, we were behind on getting our vegetable garden in this year. Eric worked on putting in his three sisters garden last week (he’s finished teaching for the year except for a summer course) and we both worked on the main garden after I got home from work. We finally finished planting this weekend and I spent Sunday cleaning up some weeds, filling in the asparagus trenches, and mulching the tomatoes with newspaper and straw (39 plants all together). Yay! I was so happy to have it finished and it looked really great. Years ago, our neighbor had clear cut the hill above the garden, turning it into “lawn” which they mow way too short – like 2″ tall. There is a shallow valley in the middle of this grassy slope that leads directly to our vegetable garden and when it rains, the runoff is channeled directly to the garden. Normally this isn’t much of a problem but yesterday, we got about 2″ of rain in about 30 minutes. Big problem! After the storm Eric went out to survey the damage and called me to say that the water had washed the soil (and the new seedlings with it) out from under the cucumber trellis but that this was the worst damage he saw. I think he was trying to keep me from getting too upset. I was really concerned when I drove up the driveway after work and saw that it was crisscrossed with deep channels from the heavy rain. 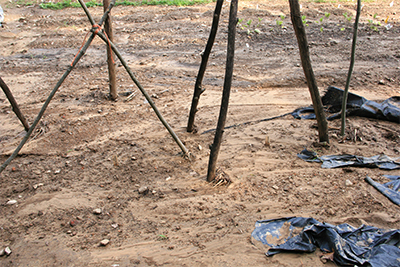 Luckily, a piece of landscape fabric washed down and acted as a dam to prevent more damage to the pole beans. Eric met me at the door and asked if I wanted to go look at the garden. Boy, I sure wasn’t prepared for what I saw! 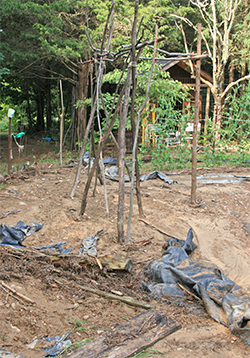 Straw, mud, rocks, and other debris were piled up around the crazy bean pole tripod/trellis that Eric had created and planted around on Saturday. 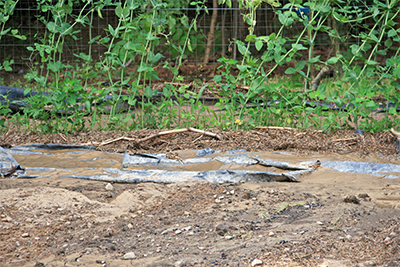 As he had already warned me, the water had washed out most of the soil from under the cucumber trellis. The small asparagus bed I put in early in the spring sustained a bit of damage as some of the soft soil I used to fill in the trenches had been carried away. The beautiful beds that I had made using my old Troy-Bilt tiller had been washed over leaving them level with the rest of the garden. They were covered with rocks of various sizes and some of the soil (hard to tell how much) had washed away. I have no idea if the bean seeds are still where I planted them or if they washed away as well. Time will tell! 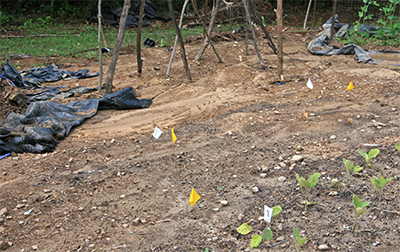 A double row of beans were planted in the beds marked with the flags. Now it’s hard to distinguish where these beds are. Straw from the tomatoes washed down and collected around a bean pole. Luckily the potatoes, onions, peppers, carrots, squash, and beets were above the area where the water rushed through the garden so they were spared from any major damage. The tomatoes were fine thankfully, except that some of the straw I put down had been washed away. It was basically a big soggy, muddy mess. Happily, one side of the cucumber trellis was still intact and the seedlings were still there. If the water had cut over a few inches more, they would have been washed away with the rest of them. Eric spent the better part of an hour digging a trench to divert any more water around the edge of the garden. Thunder was rumbling in the distance so we weren’t sure if more rain was on the way or not. 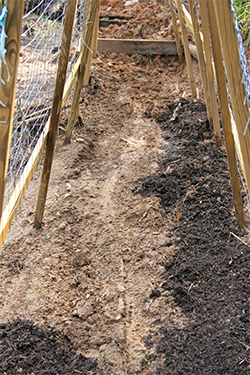 I started trying to replace some of the soil that had washed away from under the cucumber trellis but it was so spread around and so muddy that it was difficult shovel it up in any quantity. I finally gave up and put some compost around the remaining seedlings to hold them until things dry out a bit and I have more time. This weekend we’ll get things cleaned up and looking better. 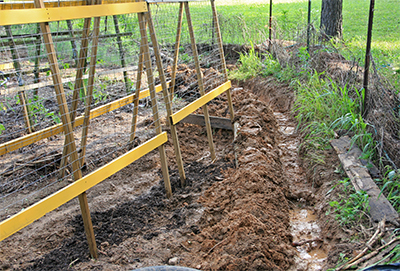 The deep trench Eric dug should keep the garden from being washed away again. He plans to reinforce the walls with pieces of slate. I guess in all, we were pretty lucky that the garden didn’t sustain more damage. Eric is going to make a more permanent drainage ditch and we are also planning to put some straw bales and possibly a silt barrier along the fence at the point where the water came in. Hopefully this will never happen again! 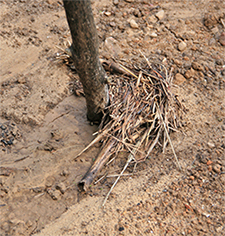 Water swirled and washed soil away from the bean poles. I think the seeds are still there but it’s hard to tell. For the last 2 weeks I’ve been in beautiful Vermont visiting my family and moving our son into his new apartment in Burlington where he is attending graduate school at the University of Vermont. What a beautiful area. 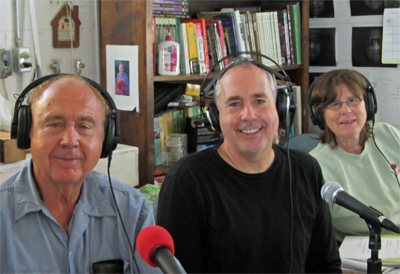 His lab is right on Lake Champlain – pretty good duty I’d say! This sign truly represents the gardens surrounding Leslie’s house! 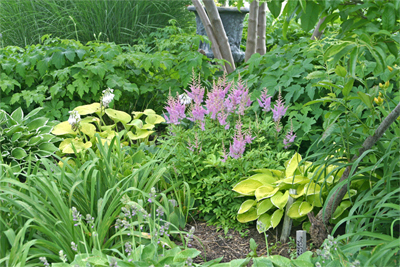 Large-leaved hosta, Rodgersia, ferns, Ligularia, and Trollius flourish in gardens near the pond. 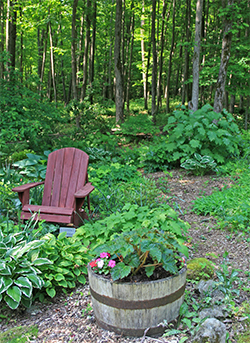 Because she has so much shade, many of her gardens feature perennials with big, bold leaves that become striking focal points; perennials like Ligularia, Rodgersia, Darmera, Kirengeshoma, and a nice variety of large-leaved hosta. 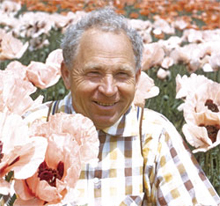 I must admit that the majority of these wonderful perennials originally came from Viette’s! 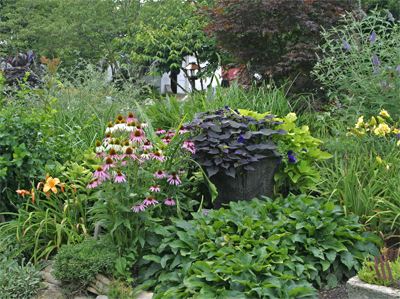 These particular species, like many shade loving plants, are better known for their foliage than for their flowers. 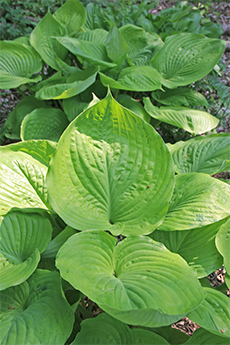 Since capturing the available sunlight is more important than conserving moisture, perennials that grow in the shade often have leaves with large surface areas. 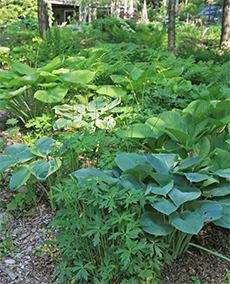 Down by Leslie’s pond where it’s shady and the soil remains moist, these plants have developed huge leaves. I call them “fairy umbrellas” – especially the Darmera with its broad flat leaves. 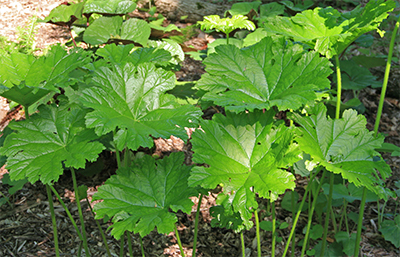 Darmera peltata, the Umbrella Plant, brings a very unique foliage effect to the woodland garden. The Hosta ‘Sum and Substance’ had huge leaves; many over 20″ long! It seems that this year the foliage is especially grand. I don’t remember the Rodgersia and the hosta ‘Sum and Substance’ being quite this big in previous years. They are particularly impressive this year. I’ve never been to her gardens in late May before but this hasn’t been a typical spring for them. Like much of the rest of the country, they had an unusually warm winter with very little snow and spring came early. I think the most telling sign that the winter was mild in Vermont was her Viburnum macrocephalum (Chinese Snowball Viburnum). This is the shrub that I mentioned in my very first blog post, “A Warm Blanket of Snow”. The shrub that, since she planted it many years ago, has only bloomed at the bottom where the snow cover protected the flower buds from the extreme cold and desiccating winds. 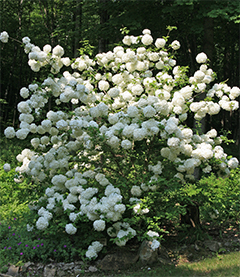 Leslie’s Viburnum macrocephalum blooms in its full glory this year! This year it is amazing! 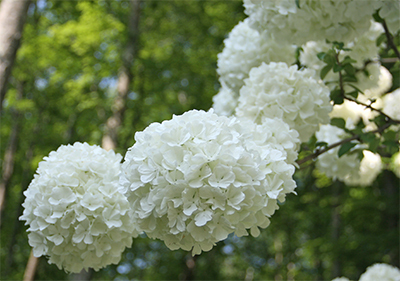 It is literally covered with beautiful snow white flower clusters that are 5″-6″ across. I actually thought it was a hydrangea because I’d never seen a viburnum with such huge flowers. I took loads of pictures and showed them to Gerry Coggin, our garden center manager, who admitted that he had never seen such a beautiful specimen. Leslie said that this is the first time she has seen it covered with blooms like this. I guess that is one benefit to the warmer winter although many Vermont businesses, especially the ski areas, would beg to differ! 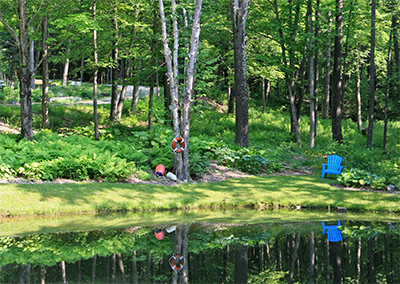 The pond reflects the beautiful plantings surrounding it. Large, bold leaves of Kirengeshoma combine nicely with other shade perennials and make a wonderful focal point in the woodland garden. 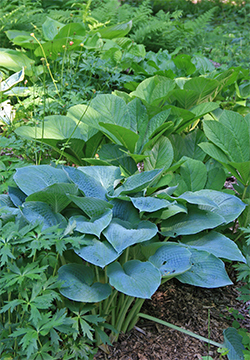 A beautiful blue hosta stands out against the green Rodgersia. 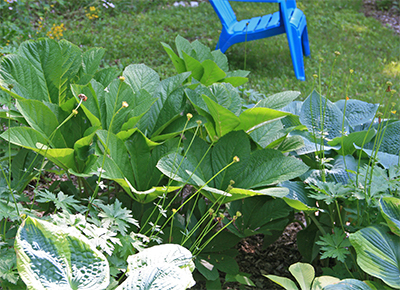 Rodgersia with its unique foliage is a great perennial for the shade. 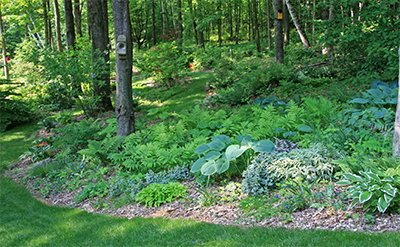 Another shade garden at the edge of the woods incorporates many native ferns along with her other plantings.